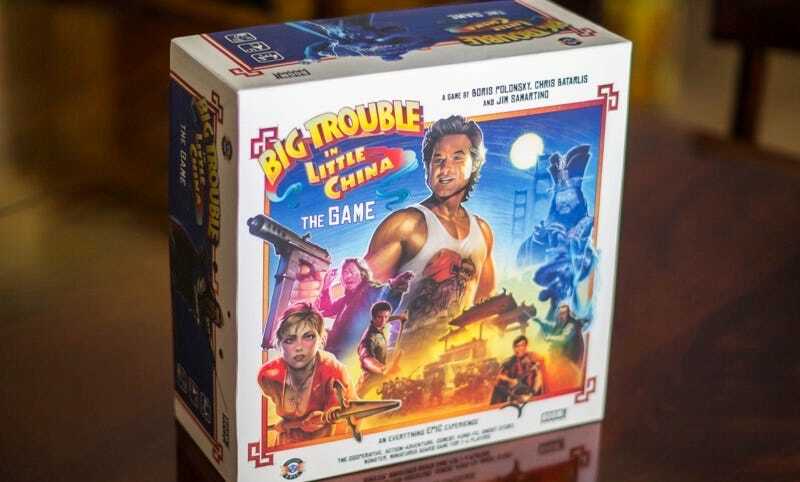 We first heard about Big Trouble in Little China: The Game last summer, and today we’re getting a first glimpse of what the box art, game art, and—most excitingly—the miniatures will look like in the final product. Three words: Mini Egg Shen. It’s a thematic, cooperative, strategy, miniatures, adventure game that allows 1-4 players to experience the events they remember from the film as well as create new adventures of their own. The game plays in two acts: Act One uses the front side of the game board: Chinatown, while Act Two takes place on the back: Lo Pan’s lair. Players will choose from six characters, each with unique abilities, and will use custom dice for actions, quest tasks and combat. They will also be able to use the communal fate dice, which come with a fun risk/reward mechanic. After completing quests and upgrading their characters, players will move to the back of the board for the big showdown with Lo Pan! Will the heroes stop Lo Pan’s evil scheme in time, or is everything gonna go to hell? And some of the miniatures. Alas, no glimpses of Jack Burton or Lo Pan (nor the game’s “thematic dice”) yet, but the inclusion of fan-fave character “Wing Kong Six Shooter” clearly indicates the level of detail we can expect from the finished product. Speaking of the finished product, Big Trouble in Little China: The Game will be available for pre-order later this year; you can sign up here for updates, or check out the Facebook page.